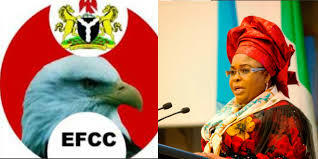 The Economic and Financial Crimes Commission (EFCC) has filed a court application asking for the interim forfeiture of two property allegedly belonging to Patience Jonathan, wife of Goodluck Jonathan, former President. One of the property, which the EFCC described as a “magnificent architectural edifice”, is an uncompleted eight-storeyed building located at the central business district in the heart of Abuja. Though the commission said it hadn’t obtained the appropriate value of the property, it is estimated that the amount should be in the neighbourhood of N6billion. According to court documents, the building was acquired by Patience through Aribawa Aurera Reach-Out Foundation, a non-governmental organisation that she allegedly owns. The EFCC said chances are high that the building was constructed using proceeds of crime, as the suspected owner, Patience, was a mere Permanent Secretary and could not have afforded such a building. “Inference may be drawn from investigation that the suspect’s (Patience) last known official position was Permanent Secretary in Bayelsa State. Hence, there is no way such magnificent architectural edifices could have been built within a short space of time,” the documents read. The EFCC said it had written to the Corporate Affairs Commission (CAC), asking for the identities of the directors of the foundation. Another letter was written to the Abuja Geographical Information System to ascertain how and when the property was bought. Yet another letter was written to eight banks: Skye Bank, Fidelity Bank, First Bank, Union Bank, Guaranty Trust Bank, Zenith Bank, United Bank for Africa and Unity Bank to provide relevant information on the investigation. The second property, which the EFCC wants forfeited to the Federal Government, is a luxury hotel located at the Mabushi area of Abuja. 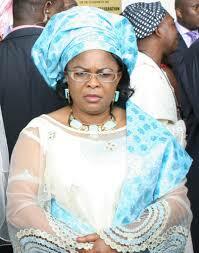 Valued at about N2bn, the property was once marked for investigation by the EFCC, but the inscription was wiped off. “In view of the foregoing, I request for an interim forfeiture order on the two properties amongst others linked to the suspect and believed to have been acquired from the proceeds of crime,” the EFCC stated. The EFCC also said it had traced three other property in the Karsana, Wasa and Idogwari areas of the Federal Capital Territory, Abuja, to Patience. Documents from the Abuja Geographical Information System (AGIS) show that the property were bought in the names Finchley Top Homes Ltd. and AM-PM Network Limited. Already, the bank accounts of Finchley Top Homes Limited, a company that was also traced to Patience, had been frozen by the EFCC months ago. However, Ifedayo Adedipe, a Senior Advocate of Nigeria and counsel to Patience, said he was unaware of the fresh application filed by the EFCC, adding that his client was being witch-hunted. He said that if the reports were true, then the EFCC was violating court processes as it has a pending case at the Court Appeal challenging the interim forfeiture of Patience’s assets. “I am not aware of any of these but we are in court over the freezing of her accounts and that case is at the Court of Appeal level and we have a fundamental human rights’ charge against them in court,” Adedipe said. “My thinking is that the EFCC, which says nobody is above the law, should have waited for the judiciary to finish its process. In my humble opinion, it appears they are abusing judicial powers. “When you file something today, tomorrow you file another. Why not put everything in one pot? That is why they lose cases. In April this year, a Federal High Court in Lagos ordered a temporal forfeiture of $5.8 million also belonging to Patience Jonathan, after the EFCC said the money was suspected to proceeds of crime. The case is now at the Court of Appeal.